The eco-friendly, innovative GROHE Blue Chilled + Sparkling faucet. NEW YORK, N.Y., April 15, 2015 – Picture this: someone sits at a table, a glass of tap water on the left, and bottled on the right. Can you guess which option they will choose? If your bet is on the latter, you’re probably correct – an overwhelming number of Americans prefer bottled water over tap. According to USA Today, the amount of bottled water Americans drink has risen nearly every year for more than two decades. This can largely be attributed to three main factors: the growing inclination to opt for what’s healthy, better taste and convenience. Sales of bottled sparkling water have also been on the rise between 2009 and 2014, according to data from Euromonitor International, a market research firm. However, bottled water has had an impact on the environment, producing a staggering amount of plastic waste as Americans throw away an estimated 38 billion water bottles every year, according to advocacy group Ban the Bottle. The GROHE Blue Chilled + Sparkling Magnesium+ filter. Recognizing these priorities and preferences, GROHE revolutionized how we enjoy water at home with the launch of the GROHE Blue Chilled + Sparkling faucet in late 2013. The award-winning, innovative faucet allows users to seamlessly switch between three water settings; filtered still, medium sparkling and full sparkling. Now, the experience has gotten even better with three new advanced technology filters and an eco-friendly cleaning cartridge. Three different filter options, each compact and easy-to-install under the sink, are available to cater to a user’s specific water needs. Below, Dixon outlines each. The GROHE Blue Chilled + Sparkling Magnesium+ filter, with patented technology, has a special ion exchange resin that adds magnesium. They are the only provider able to offer this advanced feature. Through five layers of filtration, the 5-stage filter removes all unwanted substances that will affect the taste and smell of water. “The option eliminates chlorine, lime scale, heavy metal and particles for a pure and fresh water taste,” Dixon advises. The first step, pre-filtration, removes larger particles. Second, the active carbon and ion exchange enables maximum yield. In the third step, the high-performance exchanger kicks in, for the highest capacity in the smallest space. Next, activated carbon filtration eliminates unpleasant tastes and odors while filtering and purifying bypass water. To conclude the process, fine filtration captures even the finest particles for the purest water at all times. Big name bottled brands like SmartWater and Dasani enrich their water with magnesium, which adds taste and is a heathy mineral, and with the Magnesium+ filter option for GROHE Blue Chilled + Sparkling, these benefits are available right at home. The GROHE Blue Chilled + Sparkling Active Carbon filter. 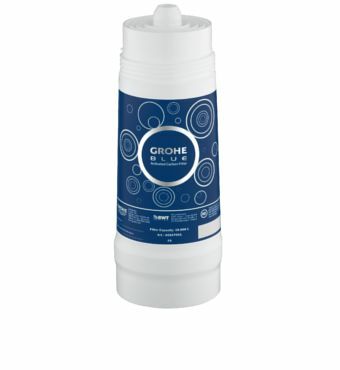 GROHE is the only manufacturer offering patented technology in the filter that allows for ion exchange and the addition of magnesium. Magnesium helps to prevent cardiovascular disease and regulate high blood pressure. It also may reverse osteoporosis and helps treat diabetes, migraines, insomnia and depression. In addition, “water in balance,” where the pH level is neutral, is a major factor in achieving the best taste and sensory properties of end products like tea and coffee. Because levels of water hardness vary across the US, affecting the taste and ability for carbonation, GROHE has developed a specialty filter designed for regions with soft water. 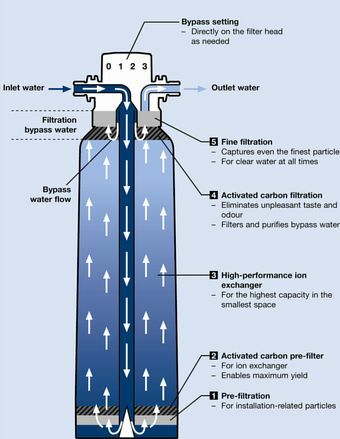 This Active Carbon filter works properly with soft water to ensure proper levels of carbonation. 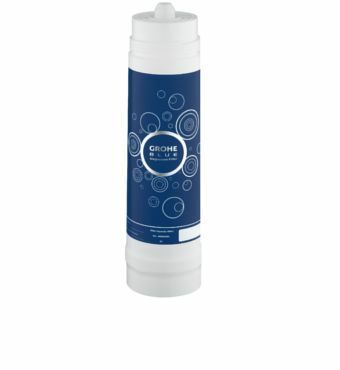 GROHE Blue® Bio-Clean cleaning cartridge. In addition to these filters, GROHE is now offering a new hazard-free cleaning cartridge, GROHE Blue® Bio-Clean, which is also unlike anything else in the market. “We set out to create a bio-friendly cleaning cartridge to minimize any impact on the environment and also to reduce the risk of accidents at home,” Dixon explains. 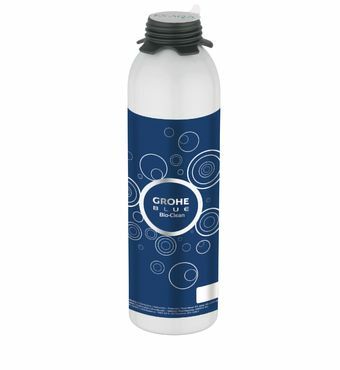 Consuming the cleaning fluids in GROHE Blue® Bio-Clean is completely safe – no safety notes are required on the packaging because of its harmlessness in every way, from the environment to children in the household. The cartridge can also be used to disinfect hands as well as the filter head. With patented technology, the cartridge produces electrochemically activated water that contains a minimum of 70 mg/l of the oxidative active substance sodium chloride. This substance causes “micro bubbles” to develop in the water, which cause bacteria and biofilm to blast open and disintegrate.  GROHE recommends cleaning the GROHE Blue Chilled + Sparkling Water System every six months, or after a long period of not using it, like in a summer home, for example.